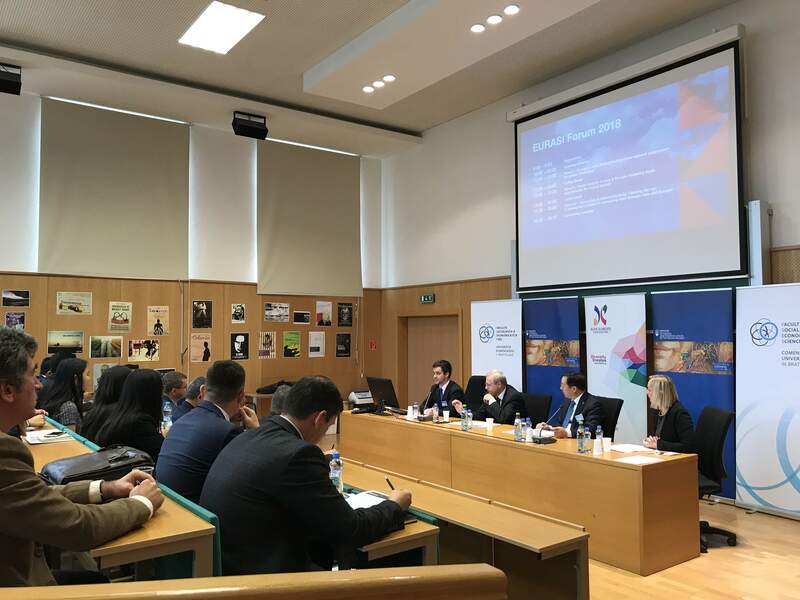 Last weekend, EURASI forum 2018 organised in conjunction with Model ASEM Bratislava Spin-off 2018 gathered more than 70 participants from 22 countries of Europe and Asia to discuss cooperation and challenges of the two continents. 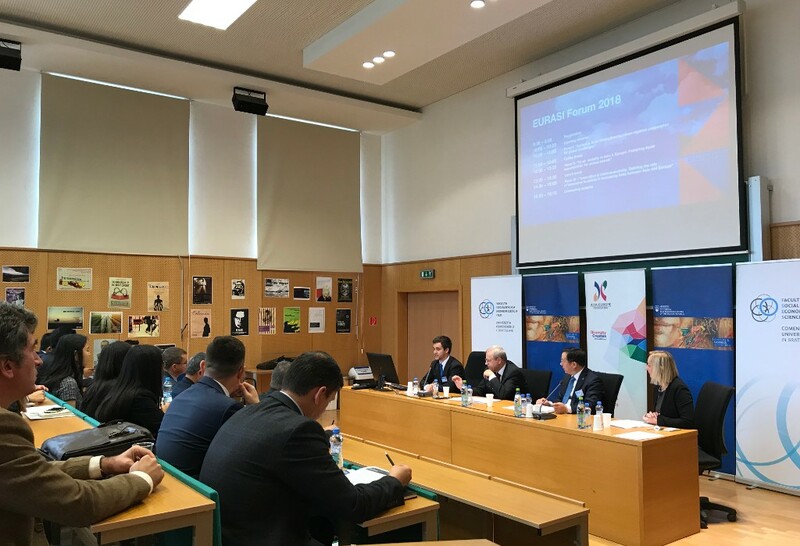 Opening remarks delivered by Michal Brichta - EURASI Forum 2018 chair; Michal Kottman - Director-General, Directorate-General of Minister of the Ministry of Foreign and European Affairs of the Slovak Republic and ASEF Governor from Slovakia; Xiangyang Sun - Deputy Executive Director, Asia-Europe Foundation; Lucia Mokrá - Dean, Faculty of Social and Economic Sciences of the Comenius University in Bratislava (from left to right). The program of the forum was divided into three panel discussions, each of which was dedicated to one of the three ASEM pillars - political, economic, and socio-cultural. The three panels were attended by representatives of various sectors including national diplomacy, academia, international organisations, and business. 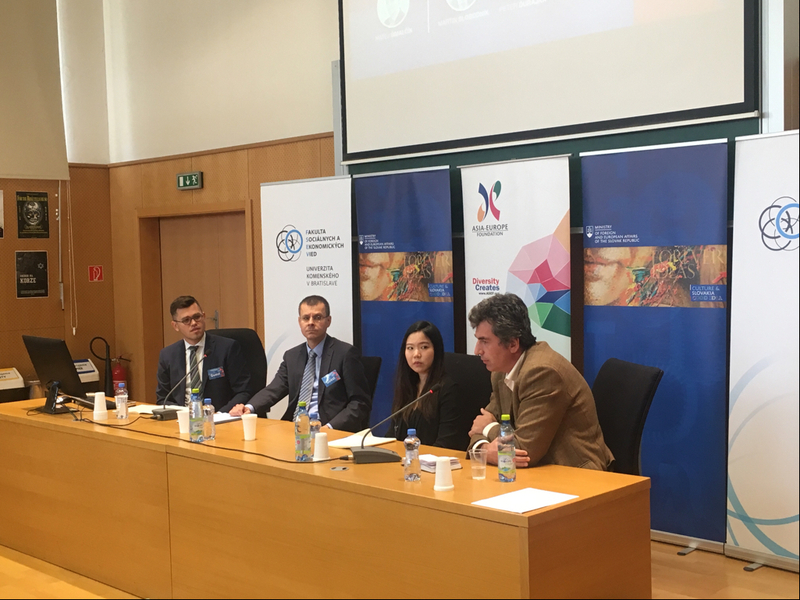 The first panel attended by Matej Šimalčík (moderator) - Executive Director, Institute of Asian Studies; Peter Ďurajka - Diplomat, Asia and the Pacific Department of Ministry of Foreign and European Affairs of the Slovak Republic; Thareerat Laohabut - Model ASEM Bratislava Spin-off 2018 Delegate; Martin Slobodník - Vice-dean, Faculty of Arts of Comenius University in Bratislava (from left to right). The first panel titled "Europe & Asia: Strengthening cross-regional cooperation for global challenges" tackled general issues of the Europe-Asia cooperation while focusing on their political and security-related context. In the second panel - "Youth mobility in Asia & Europe: Fostering equal opportunities for mutual benefit" panelists discussed their practical experience gained from student mobility, as well as possible frameworks that could enhance mutually-beneficial youth mobility between the two continents. The third panel titled "Innovation & interconnectivity: Defining the role of innovative business in increasing links between Asia and Europe" was dedicated to issues of the cross-regional economic cooperation with a special emphasis on challenges that are creating barriers to a more significant flow of investments and innovative ideas between the two continents. The second panel attended by Gabriel Weibl (moderator) - Lecturer, Faculty of Social and Economic Sciences of the Comenius University in Bratislava and Researcher, Slovak Academy of Sciences; Supaporn Chalapati - Assistant Professor, I-Shou University; Miroslava Kurčíková - Model ASEM Bratislava Spin-off 2018 Delegate; Oscar Boije - Project Manager, Asia-Europe Foundation (from left to right). 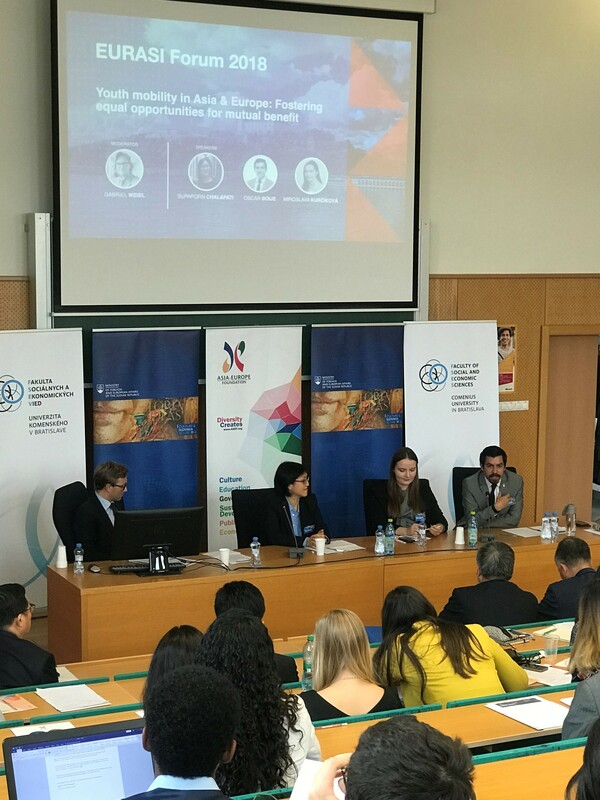 We would like to express our sincere gratitude to Asia-Europe Foundation (ASEF), Ministry of Foreign and European Affairs of the Slovak Republic, Faculty of Social and Economic Sciences of Comenius University in Bratislava, as well as all our distinguished partners and panelists for their great support and active participation. 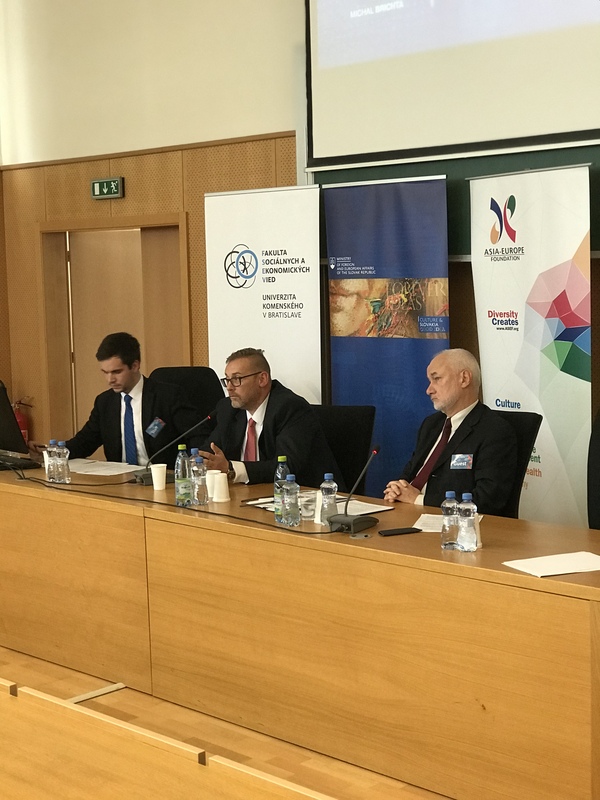 The third panel attended by Michal Brichta (moderator) - Chair, EURASI Forum 2018; Csaba Wolf - Business Development Director, Deloitte Hungary and member of Central and Eastern European Center for Asian Studies; Drahomír Štos - Director, Economic Diplomacy Department 2 of Ministry of Foreign and European Affairs of the Slovak Republic (from left to right).